A jack plane, including this one, is mostly used to true the surfaces of a board and dimension it. It follows coarser tools – the mill saw or, if substantial thickness must be removed, the scrub plane. 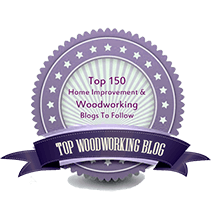 It is followed by the jointer plane, if needed, and then the smoothing plane or other methods, such as scraping and sanding, to create a finished surface on the wood. Thus, the jack is a fairly rough tool. Yet it is expected to leave a surface without major defects to avoid having to remove too much wood with subsequent tools. 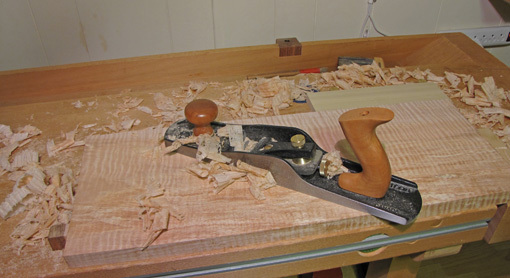 The role of the jack plane dictates its setup. The blade should be sharpened with a moderate camber – a balance between the need to remove wood quickly and leave a decent surface. Judging the proper amount of camber comes with experience, may vary from job to job, and is most easily determined by eye, but it is important to note that a blade that is bedded at a low angle with the bevel up requires more camber, as judged from a 90̊ view, than a blade which is bedded at a higher angle with the bevel-down. Please refer to an earlier post for a full explanation of this. I prepare the blade with a primary bevel of about 30̊ and a secondary bevel of about 38̊ which, with the Veritas’ 12̊ bed, yields an attack angle of about 50̊. Going significantly higher than this makes the plane simply too hard to push through the wood for this type of work. A smoothing plane is a different matter in this regard. There, fewer and finer shavings are taken, so higher attack angles are practical and may be necessary to avoid tearout. But wait, isn’t the main point of a BU jack to use high attack angles and prevent tearout on difficult woods? No, not in my opinion. A jack plane does most of its job best when used diagonally across the grain. This makes it easier to accurately remove surface distortions and avoid tearout, obviating high attack angles. I regularly jack plane curly woods diagonally or even nearly perpendicular to the grain. For the few occasions when a 50̊ attack angle creates significant tearout even with a diagonal stroke, such as with very swirly grain, it is time to employ one of the wonderfully handy advantages of a BU plane. The regular blade can be easily swapped for a toothed blade (sharpened at 40°). This magical blade can manage the most cantankerous of woods. A further negative consequence of using a blade sharpened with too large an angle (such as 48̊ to produce a 60̊ attack angle) in the BU jack is that it becomes difficult to set the projection of the blade. It is frustratingly difficult to find the middle ground between a shaving that is too light for jack planing and an impractically deep projection, especially if the blade is starting to dull. 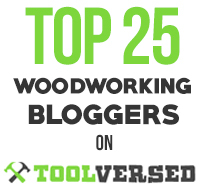 Imagine trying to pare with a dull chisel sharpened with a 48̊ bevel – you’ll either scrape the wood or dive into it, with little control. As you near the end of the job with the jack, back off the blade projection to increase accuracy and improve surface quality, thus getting the wood ready for the next stage of preparation. The next post will discuss securing the board to the bench for jack planing, steps in setting the blade projection, and some particular features of the Veritas BU jack. I’ve been using my BU jack and jointer with a blade honed at 47 deg. And one mysterious problem I’ve had is that the blade will stop cutting after a relatively short length of use compared to my bevel down plane cutting at 45 deg. What I mean by short time is that I get about 15 minutes of planing with the BU plane and then it just completely stops cutting. Meanwhile I can’t even remember the last time I sharpened the bevel down plane. It’s been weeks…months. And it still cuts. When I sought an explanation, the one answer I got had to do with wear bevels and loss of clearance angle. If it’s right, then it’s a major limitation of a bevel up plane bedded at 12 deg, and it’s been making me wonder if I need a bevel down plane with a high angle frog. But could there be some other explanation? I’m wondering if this is connected to your remark about difficulty in setting the blade projection. Is it difficult to set the blade projection with any high angle configuration? Or is this a special feature of the bevel up plane? I find it hard to get a good edge at a high honing angle like 47°. I suspect your blade is getting dull. Then that large, dull wedge is hard to set well, as I discussed in the post, it attacks the wood with a lot of pressure before the fibers are severed, and then springback of the compressed fibers rides the cutting edge, with only 12° of clearance to begin with, away from the surface. That’s my best guess as to what’s going on. I don’t think wear on the flat side of the blade, per se, is the cause of this problem, but that certainly occurs on all bevel up blades bedded as low as 12°, regardless of the honing angle. Personally, I think BU planes should have a bed closer to 20°, but that is another matter that I discussed in an earlier post (June 2010). Try sharpening your BU jack plane blade with a secondary bevel of about 38° and I bet it will work better. You can use your bevel-down jack plane with a 45° frog and the blade sharpened at 30-32° and take diagonal strokes. If you really need a higher angle, you could get a high angle frog, or, much easier, get an extra blade and add a 10-15° back bevel to yield an attack angle of 55-60°. As usual, there’s more than one good way. Good luck. Let me know how it goes if you get a chance.